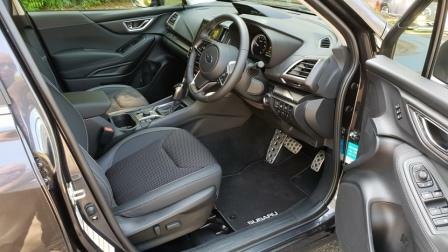 The car reviewed has a five speed manual and it takes a bit of getting used to. Not because it’s a manual but because there is almost no spring pressure on the gate’s mechanism. It’s limp, weak, and almost void of any real feel through the changes. That’s matched by a clutch pedal feel of pretty much the same. There’s no weight (just like the car at 870kg dry), no real pressure required to push it down. But once both are recognised for their foibles, they mesh quite well, and it really only took an hour or so to get the hang of how and where to utilise the pair in their movements. They also work well with the small engine. The 1.2L DualJet engine has just 120 torques and that comes at 4400 rpm. Simply put, it means that a bit of gear rowing is required, as is a bit of patience in regards to forward motion. 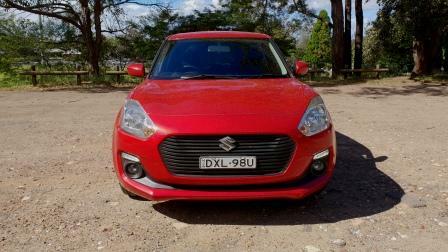 The upside is economy, and Suzuki quotes around 4.5L/100km for the combined cycle. It needs to be economical as the fuel thimble holds just 37 litres. 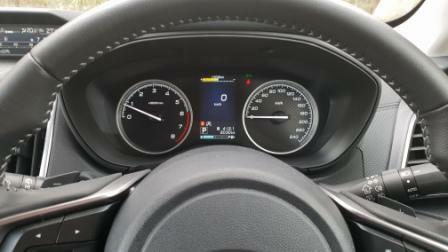 On our test the car, literally brand new at 11 kilometres on pick up, covered 300 kilometres on a half tank. Acceleration is leisurely, at best, however once the engine reaches 3000rpm the characteristics change noticeably. There’s a change of note, urge, as it is, increases, and it feels as if it spins just a bit easier. The five speed sometimes feels as if an extra gear would be handy however considering fifth sees around 2000rpm at highway speeds, it wouldn’t have the required torque to take advantage of it. On coarse chip roads the lack of sound insulation isn’t just noticeable, it’s painful. The constant drone, and drumming, from the 185/55/16 rubber transmitted to the cabin via the MacPherson struts and torsion beam suspension, would drown out normal levels of conversation and radio, AM/FM only by the way. On the smoother blacktops it was naturally quieter and also ramped up the fun factor in the drive. The comparatively big wheelbase, 2450mm, inside the tiny body length, 3840mm, means the Swift is very chuckable in corners, with an almost point and shoot handling style. The short travel suspension did mean some bumps crashed through, but the overall result is grin inducing…in the right hands. 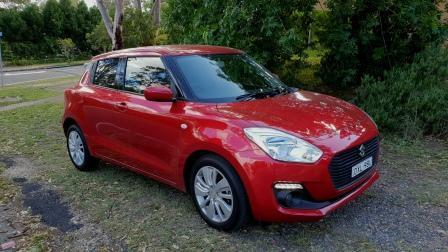 The Swift itself underwent a mild transformation externally over a year ago, with a look more akin to the Baleno thanks to pumped out tail lights and reshaped headlights. the fun factor is shown by the front end having a “smile” thanks to the horizontal lower grille and upturned corners. These house LED driving lights and bracket a wide hexagonal grille. Inside it’s basic, but functional. The dash’s upper section has the Euro inspired sweep from the curve of the windscreen through to the doors, and that’s mirrored in a curve closer to the binnacle that houses a simple pair of dials and a relatively underused monochrome info screen. It shows trip and fuel consumption, and that’s it. The touchscreen is simple to use, uncomplicated in its usage, and sits above traditional dial and slide aircon controls. The audio system is moderate in quality but does have Auxiliary/USB, Bluetooth and voice control, plus Android Auto and Apple CarPlay. Safety levels in the standard Navigator GL are fine. Six airbags, standard passive driving aids, and cruise control, are a good starting point, with the Navigator and Safety Pack version adding Adaptive Cruise Control. 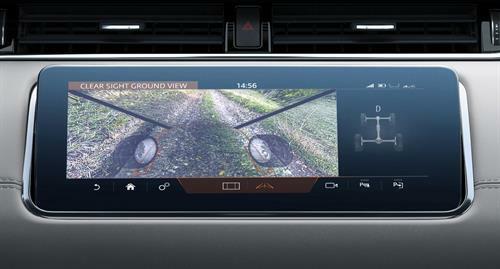 Reverse Camera is standard across the range but the Navigator does not come with parking sensors. 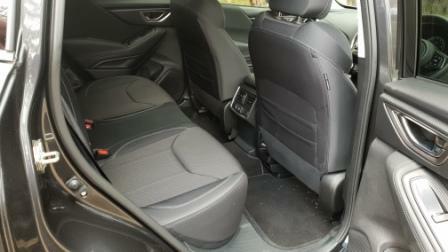 Naturally the seats are manually operated, and are comfortable enough for the price point of the Swift Navigator GL. Rear leg room is fine for near-teens but not recommended for people of six feet in height, for example. 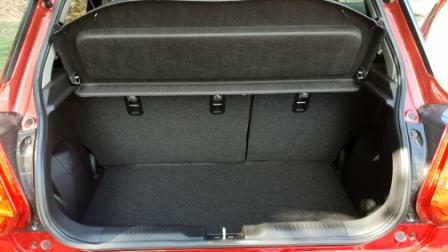 Cargo room is adequate, with a maximum of 556L with the rear sears folded. On its own, the cargo will hold almost all of a standard family weekly shop. 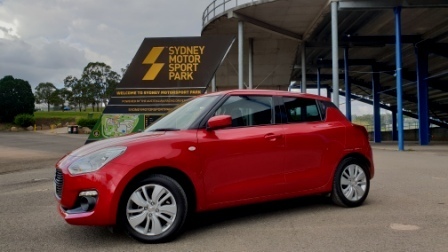 As has been mentioned in our previous reviews, the Suzuki Swift is an ideal car for those getting a start in learning to drive. The basics are all in place, the safety factor is good enough to start with, and the softish clutch & shifter won’t scare a new driver. And at just on $17K it’s a good price. Above all, once the car is understood, it really is a fun machine to roll around town in. 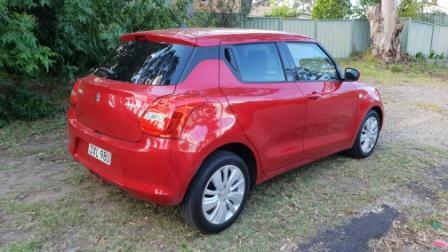 More details on the 2019 Suzuki Swift GL Navigator can be found here. Isn’t It Ioniq, Asks Hyundai? Korea‘s Hyundai has released details of their new-to-market hybrid Ioniq. A three drive mode choice of purely electric, battery and petrol engine, and plug-in hybrid (PHEV) offer versatility in a shapely four door coupe’ style. 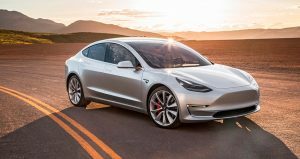 In the technology stakes, the car’s lithium-ion polymer bettery will charge from zero to eighty percent in around 25 minutes, with the drive range of up to 230 kilometres being available. The Ioniq Hybrid offers up to 63 kilometres on battery with the 1.6L Atkinson cycle petrol engine and six speed dual clutch auto extending that range. With the petrol engine there is peak power of 77kW, peak torque of 147Nm, and combines with the electric engine’s 32 kW / 170 Nm in the hybrid and 44.5 kW / 170Nm for the PHEV. The purely electric Ioniq develops 88kW and is rated at 295Nm. Expected fuel economy is quoted as 3.4L to 3.9L per 100km for the hybrid and 1.1L/100km for the PHEV. The Ioniq Electric receives a charging system capable of 100kW via DC or direct current. Inside the Ioniq hybrid is a 8.9kWh battery for the expected 60 kilometres or so range, which of course depends on driving attitude and conditions. 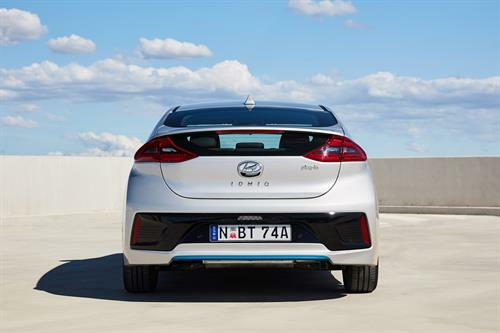 Hyundai has joined forces with JET Charge for installations of charging portals and can be sourced though the dealership network. The Ioniqs have the proven McPherson strut front, with the Electric on a torsion beam rear suspension. The hybrid and PHEV will be on the multi-link rear. IONIQ Hybrid Elite features aerodynamic wheel covers on 15-inch alloy wheels and other variants feature a range of distinctive aerodynamic alloy wheel designs in 16- and 17-inch. Each of the three engine options can be specified in either the Elite or Premium trim levels. Any version asked for will have Hyundai’s SmartSense safety package on board as standard. 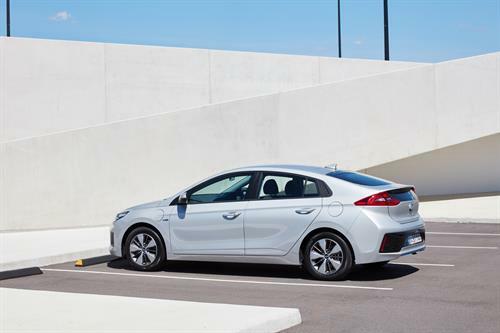 The Elite Hybrid version has the IONIQ occupants protected by Forward Collision-Avoidance Assist with pedestrian detection, Blind-Spot Collision Warning and Rear Cross-Traffic Collision Warning systems. Rear view camera and park assist is also standard. There will be Driver Attention Warning, and Lane Keeping Assist systems fitted also. 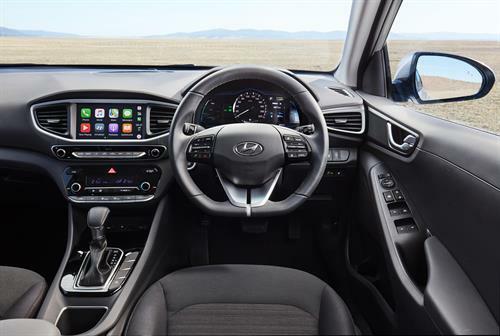 A Smart Cruise Control system completes the Hyundai SmartSense suite in every version and in IONIQ Electric this is complemented by a Stop & Go function. For the occupants enjoyment there is an eight inch touchscreen, eight speaker sound system from Infinity, SUNA satnav with ten year update allowance, Apple CarPlay and Siri voice control. Android Auto and DAB is also fitted. The Ioniq Electric has a single gear reduction driveline and, as a result, a flat floor for extra space. Regenerative braking energy recovery is standard, and can be regulated via steering column paddles. Hyundai’s standard three drive mode choices, Normal, Eco, and Sport, are standard. Charging wise, the Ioniq Electric comes standard with a ICCB, In-Cable Control Box, and for fast charging a commercially available charging 100kW box has eighty percent in 23 minutes or the 50kW box in 30 minutes. A 6.6kW on-board AC charger can charge the high-voltage battery in around four and a half hours when connected to a charging station of equal or higher capacity. With the installation of a personal charging station, this will allow a full overnight charge at home. Helping with the economy figures are the lightweight body construction and adhesives. The Advanced High-Strength Steel (AHSS) is 53.5 percent of the body. Aluminuim components such as the bonnet and tailgate save 12 kilograms with the front cross-beam, front lower arms, front knuckles, rear hub carriers, and front brake calipers also in aluminuim. Exterior dimensions are 4470 mm, 1820mm, and 1450mm (L, W, H) with a wheelbase of 2700mm. Ground clearance is 150mm. Head room is good with the Elite having front room of 994mm and the Premium with 970mm. Rear headroom is 950mm. Leg room is also decent with 1073mm for the front, 906mm at the rear. There is plenty of shoulder room with a handy 1425mm and 1396mm front and rear. Hip room is a crucial factor, and there is 1366mm & 1344 mm front and rear. 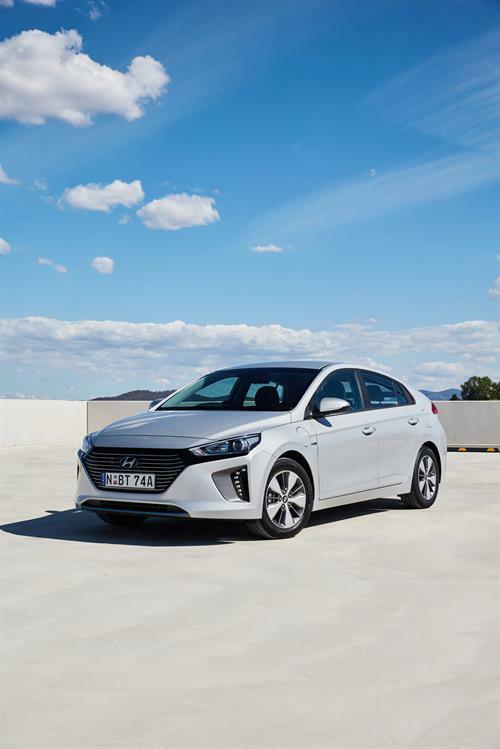 Hybrid: 563 L, Plug-in: 446 L, Electric: 455 L. Five paint colours are available across the IONIQ range – Polar White, Platinum Silver and Intense Blue Metallic, and Iron Grey and Fiery Red Mica, at a $495 cost. The Hybrid and six speed DCT is $33,990 and $38,990, with the PHEV at $40,990 and $45,490. The Electric is $44,990 and $48,990. Prices are exclusive of dealer and government charges. Contact your local Hyundai dealer and Private Fleet for availability on the 2019 Hyundai Ioniq. 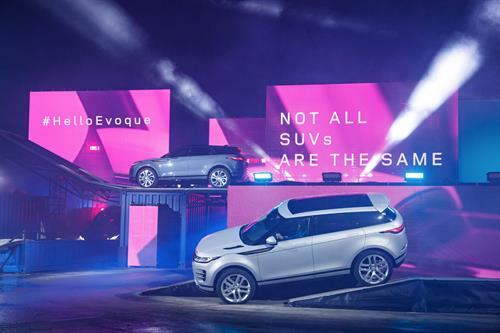 Jaguar Land Rover have released details of the forthcoming Range Rover Evoque. It will feature some groundbreaking technology including a world first that was first showcased in 2014. Called ClearSight Ground View, cameras in the front grille and on the door mirrors project a feed onto the touchscreen to show what is ahead of and underneath the front of the vehicle with a virtual 180-degree view. An added extra to the new Evoque is also visual, with the smart rear view mirror changing to a HD screen at the touch of a button. A rear mounted camera offers a 50 degree field of vision and assists in low vision situations. 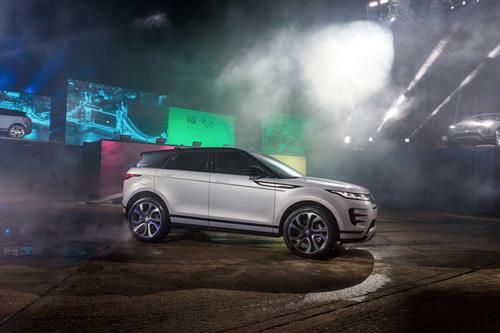 Outside, the Evoque has been given a makeover, with subtle reshaping of the sheetmetal, new slimline LED headlights, new slimline rear lights, and recessed door handles. The glasshouse is slimmer yet not compromising when it comes to all-round vision. 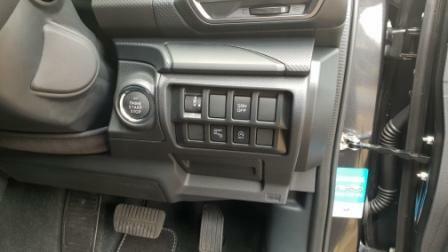 The revamped exterior has a match inside, with upgraded trim and redesigned dash for better ergonomics. The twin touchscreen and capacitive switches of the Touch Pro Duo infotainment system are the focal point of the interior environment. 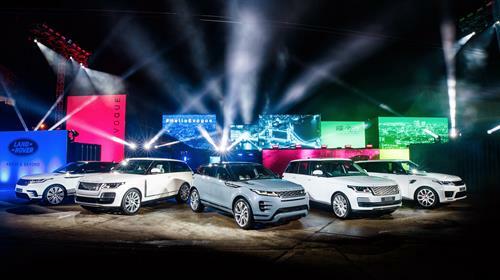 Wireless of over-the-air software updates will ensure Evoque is always at the forefront of technology for the driving systems. There is a new wheelbase for the Evoque to roll on. 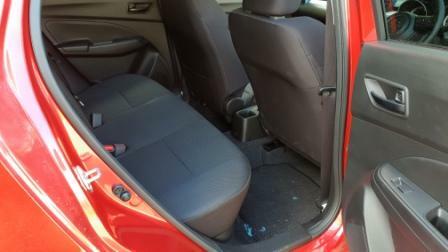 That’s yielded extra legroom and a small but usable increase in centre console storage space. The redesign has created extra luggage space, now up to 591L, with a wider entrance allowing easier loading and removal of cargo. 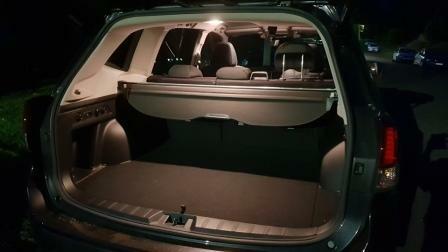 Drop the rear seats and cargo goes up to 1383L. Foot room has also been improved, thanks to revised seat mount positioning. The chassis has been engineered to accept a hybrid drive. A 48-volt mild-hybrid available at launch and a plug-in hybrid model offered around 12 months afterwards. 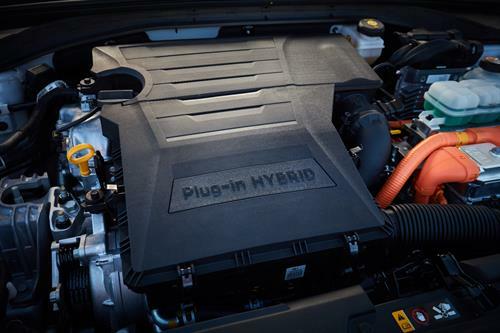 The mild hybrid works on energy recovery and kicks in when the car is accelerating. 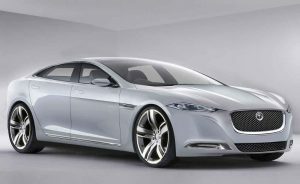 This powertrain will be available with the new Ingenium diesels and the 221kW/400Nm petrol four. A PHEV or Plug-in Hybrid Electric Vehicle is currently slated for late 2019. Being part of the Range Rover family means off roading is a natural. 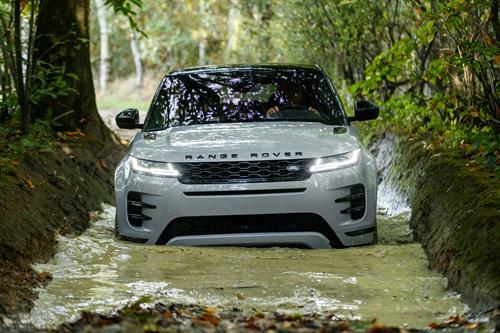 Wading depth is up to 600mm and with Terrain Response 2, the all wheel drive system will automatically sense the surface the Evoque is driving on and adapt automatically. Massive 21 inch wheels will provide a huge footprint. This smart theme continues with Smart Settings; it’s a learning system, effectively a butler wearing an AI suit. Items such as the driving position, music choices, and climate control settings. 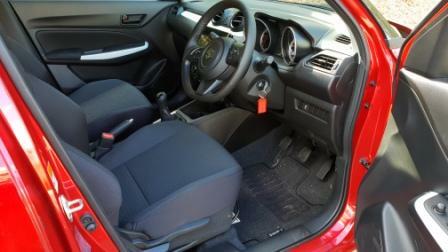 Even seat massage settings will be learned by the Smart Settings as will the position of the steering column. The release date for the Australian market is yet to be confirmed. So what have Porsche been up to really recently – and I mean currently working on? 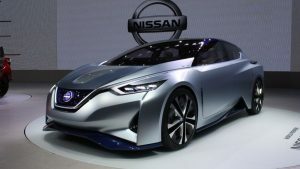 They are right into creating a new breed of E-Performance cars: exciting cars that have supercar performance, electric power and boundless attraction. 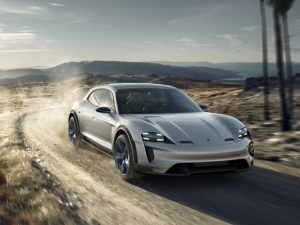 Who’s not going to like a car with the name Porsche Mission E.
The Mission E models are made up of one very quick 4-seater sedan with a height of only 1.3 m and a very special E Cross Turismo – which is basically a Mission E on steroids to tackle a range of terrain and road surfaces you’d come in contact with on any given adventure. Porsche’s Mission E is a superbly light car with an architecture that’s very distinctive. 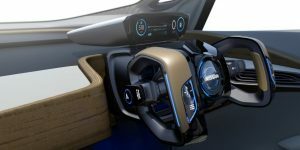 The all-electric drive gives the car absence of a transmission tunnel, and this feature opens up cabin space and imparts a lighter, more generously proportioned ambient feeling inside the car. You get four individual seats that are inspired by bucket-type racing seats. So strap yourself inside, and whether you’re driving or an occupant in the back you’ll enjoy all the appropriate lateral support you’ll need to match the driving dynamics of the car. So they are both go fast cars. Both Mission E vehicles offer a 0-100 km/h sprint time of around the 3.5 second mark. With a range of over 500 km, you can then recharge to a range of 400 km in a mere 15 minutes – thanks to Porsche’s innovative 800-volt technology. Take a look at the exterior and interior pics. They really are an exciting new breed from Porsche! Looking forward to when we can experience them over here in Australia. Here are some other special Electric supercars that will be around shortly, all bidding for attention. Do you know of any other supercar electric models? Of course, there’s already the very cool BMW i8. Ford Focuses More By Getting Active. 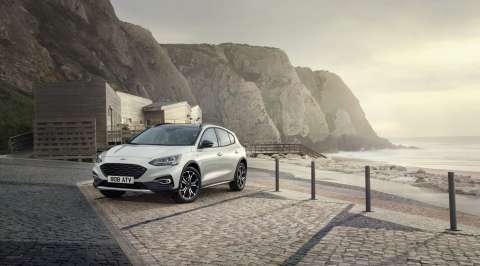 Ford’s Focus continues to expand and impress with the release of the 2019 Ford Focus Active. To be priced from $29,990 plus ORC, and built on Ford’s new C2 architecture, the Focus Active is a dedicated attempt at a smaller SUV with the ability to so some soft-roading. 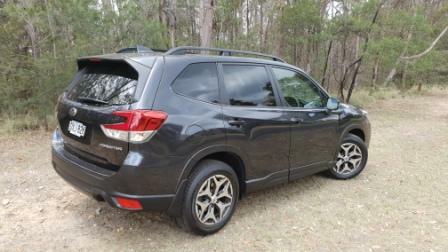 Think Subaru’s XV and you’d be close to the mark. The new body design provides an extra 20% torsional rigidity and individual suspension points have an extra 50% stiffness. It will be powered by a 1.5L EcoBoost engine with 134kW & 240Nm of torque. 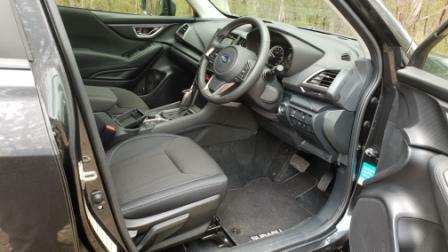 The transmission is an eight speed auto, to be available through a five trim level range of four hatches and one wagon. Economy is quoted as 6.4L/100 kilometres for the combined cycle. A new two mode drive system is fitted, with a choice of Slippery and Trail. The former is for ice and snow, the latter for dirt and sand. Options are premium paint at $650, Driver Assistance Pack at $1250 which has items such as Adaptive Cruise Control and Blind Spot Information System, Head Up Display at $300, and a Panoramic Roof at $2000. Active Park Assist and Design Pack are $1000 and $1800 respectively. Outside, the Ford Focus Active has an extra 34mm of ground clearance, 17 inch alloys, front and rear skid plates, and a bespoke front bumper with adaptive cornering LEDs. A stylish honeycomb grille, LED Daytime Running Lights, an Active specific rear and twin pipes round out the look. The Design Pack bumps the alloys to 18 inches, and adds Adaptive headlights with LEDs, and privacy glass. Standard equipment covers keyless start/stop, SYNC3 with emergency assist, six airbags, ISOFIX child seat mounts, plus Autonomous Emergency Braking with pedestrian and cyclist detection. Forward Collision Warning, Dynamic Brake Support, and Euro style Emergency Brake Flashing back up the safety package, as are Lane Keeping Aid and Lane Departure Warning. Optionable are Adaptive Cruise Control with Stop & Go technology, Blind Spot Information System and Rear Cross Traffic Alert, and Active Braking. The 2019 Ford Focus Active hatch is due for an as yet unspecified 2019 release date and blends into the existing range with the Ford Focus Trend hatch ($25,990 + ORC), Ford Focus ST-Line hatch ($28,990 + ORC), Ford Focus ST-Line Wagon ($30,990 + ORC), and the Ford Focus Titanium hatch ($34,990 + ORC). 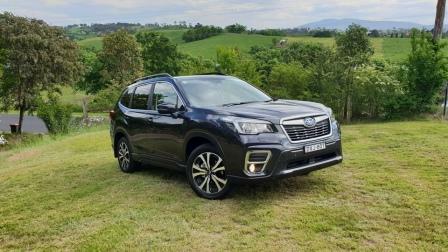 Subaru‘s recently revamped Forester range has four trim levels. There is the 2.5i, 2.5i-L, the Premium recently reviewed, and the top of the range 2.5i-S. Subaru is on a winner with the revamp due to the room inside, the station wagon looks, and the excellent stand list of equipment. We reviewed the entry level 2.5-i version, priced at just over $38K drive-away, directly after the Premium. Mechanically the Foresters are identical. Subaru’s much vaunted Symmetrical All Wheel Drive partners with a 90% new 2.5-L petrol engine. Gone is the diesel and at the time of writing there is a hint of late 2019 for anything hybrid. All transmissions are CVTs and come with a very well sorted seven step Lineartronic programming. 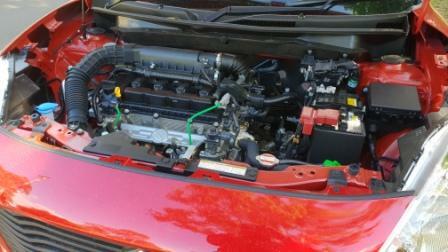 The engines are all the same and the 2.5-i was driven in a more urban based environment compared to the Premium. Consumption was never over 8.0L/100km with the final figure ticking off 7.9L/100km of standard unleaded from the 63L tank. The X-Mode drive system is standard throughout the range. The X-Mode is a system that acts directly on engine power, all-wheel drive, torque sharing at each wheel and on the brakes.With X-Mode activated, traction control becomes more sensitive. The computer will then react faster in the event that a wheel loses adhesion. It will look at which wheel it will be best to transfer the power of the engine to get out of the most difficult situations. The downhill grip control (HDC) analyzes the situation and manages braking below a speed of 20 km / h. By applying wheel-to-wheel braking, the system will allow the driver to release the brake pedal and focus only on the best direction to take. All Foresters ride on a well proven combination of McPherson struts and coil springs up front, with an independent double wishbone rear. The entry level 2.5-i felt slightly softer in tune than the Premium, with a sense of momentarily slower rebound and an ever so slightly plusher ride. But only marginally. The Tyre Pressure Monitoring System that is standard across the range also indicated the rears to be slightly less inflated that the front, oddly enough. The ride feel may have been down to the slightly different wheel and tyre combination, with 225/60/17s. Around town the Forester turned out to need a bit more of a poke of the fly-by-wire throttle to get going. In comparison to the country driven Premium, the low end of the rev range was found wanting, This contributed to the higher fuel consumption, as it does for any car driven purely in a suburban environment. There’s a sense of lag, almost like waiting for a large, single, turbo to spool up, before the CVT bites and gets the Forester underway. In traffic it’s a well balanced machine, with steering light but not fingertip twirly. It’s weighted just enough to need a small measure of push/pull, body roll in lane changing is minimal, but the tyres chosen from Bridgestone didn’t feel as if their wet weather grip was really up to the task either. Each of the corners have an independent braking sensor, and the pedal is instantly responsive to the touch. It’s a confident and positive system, pulling up the Forester straight and true consistently. In conjunction with the EyeSight forward monitoring safety system and pedestrian calibrated Autonomous Emergency Braking, it’s a very safe feeling the Forester provides. Naturally there are the mandated safety systems such as Brakeforce Distribution and Brake Assist, Traction Control and the Active Torque Vectoring. 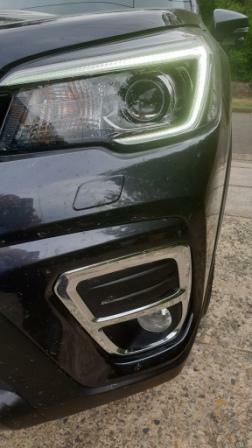 Subaru has fitted Swivelling Headlights to all models and that can be disabled. 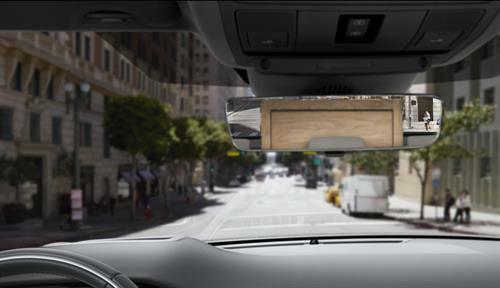 That’s part of the Vision Assist package which includes Blind Spot Monitor, Lane Change Assist, and Rear Cross Traffic Alert. 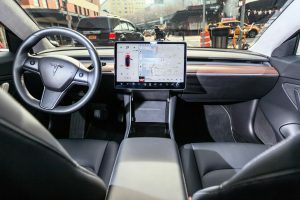 Instrumentation isn’t that different, being largely confined to the smaller 6.3 inch touchscreen in the dash, which is surrounded by high gloss piano black, and missing out on the Driver Monitoring System that the other three receive. That’s an infra-red scanner mounted in the upper centre dash binnacle that scans the driver’s face, looking for signs of inattention and tiredness. Interior trim is a bit more subdued than the Premium.There is less brightwork in the cabin but that’s balanced by the lighter shade of material used for the roof lining. It’s a shade somewhere between bone and cream, and enhances the otherwise austere look of the varying textures of black plastic. The seats are fully cloth covered, and have a interesting logo style pattern in the weave. The extra interior room comes courtesy of the subtle pulling and stretching of the chassis and sheet metal. 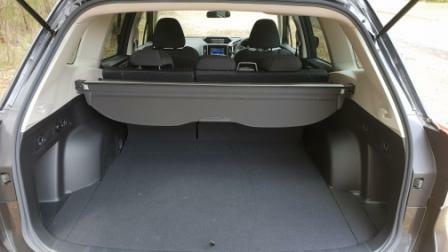 The boot opening has been increased by 134mm, cargo by 78L, and floor width by 58mm. Exterior styling also loses a bit of brightwork, particularly in the lower bumper surrounds for the driving lights. The tail gate is manually operated and houses Euro style “C” shaped lights previously embedded in the outer cluster. Polyurethane wheel arch covers and sill coverings provide both extra protection and a neutral colour to contrast the sheetmetal. 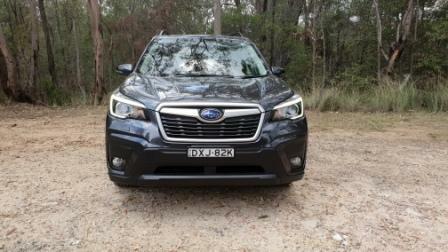 Up front Subaru has given the Forester a bluffer, more upright, nose. Subaru offers a five year warranty. For servicing costs, contact your Subaru dealer directly. If you’re a driver and buyer that doesn’t need bells and whistles then the entry level Forester is for you. There’s enough standard equipment such as the DAB audio, USB ports, and the driving aids. The EyeSight system and associated safety mechanisms are enough for most. To find out more about the 2019 Subaru Forester range, go here. Come on, fellow pet owners: admit it. You’ve sometimes considered the needs of your furry friends (who you might refer to as your fur-kids) when purchasing a car. I’ve done it myself. I’ve said no to some lovely little numbers in the past simple because they weren’t compatible with our doggo. I haven’t gone so far as to sell a vehicle I already owned because it wasn’t dog-friendly – although I did do this for my children. OK, now we’ve got that out in the open, so let’s talk about it. There you are: the time has come for a new set of wheels for whatever reason and you’re looking for a new car. You want to make sure that all of the family is happy, and this includes the four-legged members of the family. Meaning the dog, that is. Cats don’t always take too well to riding in cars – some do and some don’t, but dogs usually enjoy riding in cars. So what do you have to think of when choosing a car that’s compatible with your dog? It’s illegal to drive with a dog sitting on your lap. Obvious in the case of a St Bernard or a Newfoundland that might weigh more than you do but it also applies to Chihuahuas. A dog (or any other animal!) has to be in an appropriate area of the car where your pet can’t interfere with the driver. This means that the driver’s footwell is out of the question Small dogs probably also shouldn’t sit on the bit behind the back seats in a sedan where they block the rear view mirror. It’s best if your dog is restrained but this isn’t a legal requirement – yet! Your dog probably shouldn’t be in the front passenger seat. The only possible exception would be a poodle or other teeny dog in a handbag. 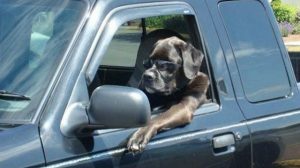 Anything larger could easily become a nuisance to the driver, either by whacking you with a wagging tail or putting a nose (or paw) onto the controls. A big dog will get in the way and a small dog would be badly hurt or even killed by an airbag going off in an emergency situation. If you feel you absolutely have to have your dog in the front passenger seat (e.g. in a single-cab ute on a nasty cold rainy day) then use one of those doggy seatbelts or Doggo will try to get all over you. Or at least my dog would. If your dog is on the back of a ute deck without a canopy, it has to be restrained so it can’t jump or fall off (or lunge at passers-by when the ute’s parked). Don’t leave your dog in the car – your dog can’t stay cool enough and can overheat very, very easily, which constitutes animal cruelty. While we’re on the topic of dogs in cars, there are two things more that you need to know. First, opening the window a weeny bit doesn’t do much to cool down the air temperature in the car, and it’s cool air that your dog needs to stay at the right temperature. Leaving the A/C on or parking in the shade does something but not much. And giving the dog water does nothing because the water heats up inside the car as well. The only time that you’re probably OK to leave a dog in a car is if it’s a nasty cold rainy day, preferably during winter. Second, breaking into a car to rescue a dog that you think is suffering inside a vehicle is considered vandalism, breaking and entering. What’s more, if the dog in question isn’t suffering from heat exhaustion – for example, if it is a chilly day – the dog will see “strange person aggressively breaking into my property” and will react accordingly. Dear well-meaning person who tried to break into my brother’s Subaru (which was parked in the shade with the windows half open during winter) to “save” the pair of pitbulls sleeping on the back seat, you were flipping lucky that said pitbulls were a soppy pair of wimps and not at all like the stereotype pitbulls. The answer to the question as to what to do with your dog when you’re out and about and need to nip into a shop where you can’t take the dog? Step One is to leave the dog at home but this isn’t always feasible. When I took my dog to the vet and I needed to pick up some bread from the supermarket practically next door, I did not drive home, drop off Doggo then go back to the supermarket! Step Two (which is what I did) is to have the right sort of car: either a ute where you can open the back door of the canopy, which does allow enough air to circulate, or something with nice handy spokes on the alloy wheels or else a towbar so you can tie the dog up outside the car. Step Three is to look for an alternative to tie your dog to. If you’re lucky, your local shops have a spot where you can “park your dog” outside. Failing that, a parking meter will do and it will keep your dog entertained with the doggy equivalent of social media at the same time. OK, but what sort of car do you need for when you’re travelling from A to B with Doggo beside you for company? The breed of car will depend on the breed of dog – and that deserves a post of its own, so I’ll cover it in Part 2. Subaru’s Forester is now up to its fourth generation and still manages to be a small to medium SUV that has the uncanny knack of not looking like a small to medium SUV. With a powertrain that is now exclusively a 2.5L petrol fed engine and Constantly Variable Transmission, spread over a four trim level range, the 2019 Forester starts at $33,490 plus on road costs for the 2.5i. The Premium tested is $38,490 plus on roads (Subaru is doing a driveaway price of $43,300 at the time of writing) and it’s shaping up to be a hidden bargain in a crowded landscape full of SUVs. The 2019 range has been given an extensive makeover inside and out, with even the engine 90% new. 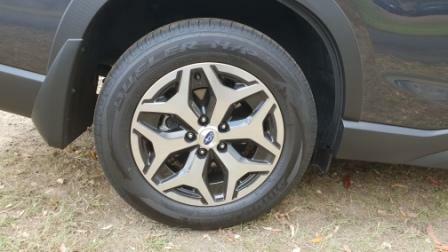 A Wheel Thing drives the new for 2019 Subaru Forester Premium. 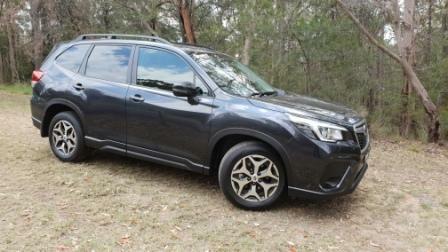 Subaru has loaded the Forester range with a good list of standard equipment across the range, and the Premium really lacks for little in this area. There are the standard electronic drivers aids, a few acronyms such as AVH, and a surprisingly possibly useful feature for those that do long country drives. By the way, AVH is Auto Vehicle Hold. 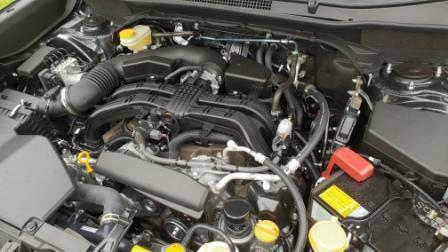 Power comes from a 2.5L petrol, as mentioned, as Subaru has dropped the diesel. However there are no current plans for a hybrid system. 136kW and 239Nm are the numbers for power and torque, with the rev points being 5800rpm and 4400rpm. The CVT from Subaru is one of the better sorted versions found and rarely did it feel out of sorts. A gentle throttle has the Premium moving away quietly and confidently. 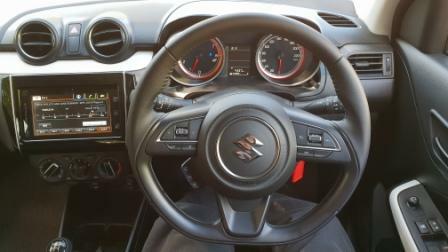 There’s then a more traditional auto feel as the CVT moves its way through the seven programmed rations, which are available for manual shifting via the gear selector or column paddles. Heavier pressure on the alloy pedal send a signal through the fly by wire throttle and the Premium responds accordingly. 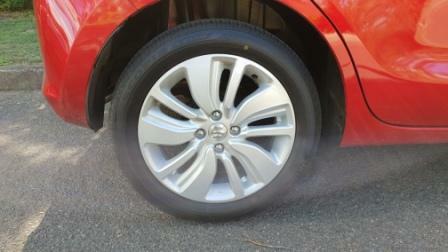 There is a more typical CVT whir up the rev range, getting to around 3500rpm before settling momentarily. As the foot lifts or the sensors read that speed is where it needs to be, the revs drop off. The only time the CVT seems a bit off is coming up to a stop and throttle feedback seems to raise a shudder on the downshifts. It also gets uncertain, when cold, shifting between Park and Reverse, Park and Drive, or Reverse and Drive. In pretty much all driving situations otherwise, the combination of quietly throbbing 2.5L boxer four and a truly fine CVT does the job. Economy for the Premium is rated as 9.3L/6.3L/7.4L (urban, highway, combined) from a 63L tank for every 100 kilometres covered. 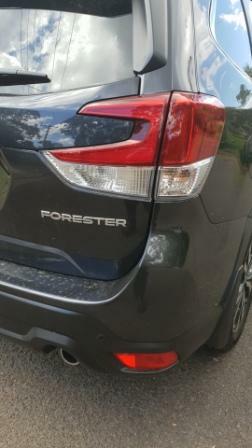 These are real world achievable figures and the Forester Premium didn’t disappoint. 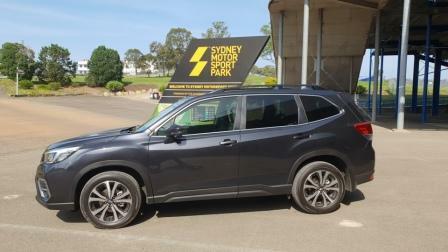 Taken on a sojourn from the Blue Mountains to Bega, on the south coast of NSW, and return, the Premium achieved 6.9L/100km. This was done over 1100 kilometres and with a four human passenger, one canine passenger, and cargo load. Considering this takes the 1546kg (dry) machine to over 1800kg, it’s a better than decent figure. The cargo section itself in the Premium is a minimum of 498L, and this goes to 1768L. 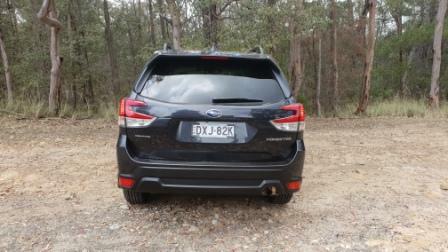 Access is via a powered tail gate with height memory function and Subaru have relocated the light to the roof. There are shopping hooks and a 12V socket here also. The loading bay is at an easy to lift and load height. The doors are wide opening for easy access and the front seats are powered, plus a two position memory for the driver is here. 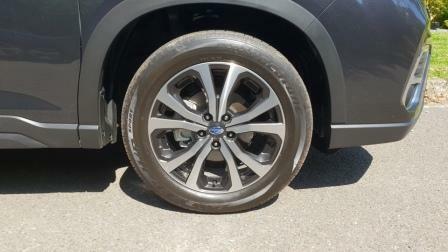 Rolling stock for the Premium are 18 inch alloys with Bridgestone 225/55 Dueler rubber. 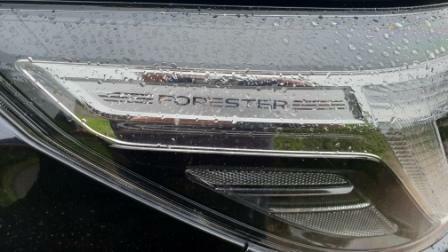 What isn’t immediately noticeable is the physical change to the Forester. Although looking virtually the same as the preceding style, there’s been growth in all dimensions, from height, width, length, to interior measurements. The headroom for the passengers genuinely feels overdone, with close to what feels like twenty centimetres of headroom. The cargo capacity, for example, has jumped by 78L. The floor width has gone 58mm wider, nearly an inch taller at 22mm, and the opening width has gone up by a massive 134mm to 1300mm. Up front Subaru’s designers have continued the “C” LED look, with splashes of chrome for the lower corner globe driving lights. The rear goes Euro too, with the tail light cluster also a strong “C” motif. Inside the Premium it’s almost business as usual with the triple LCD screens and the huge amount of information available. It’s a look that echoes the Europeans, with a sweeping arch that starts and ends in the upper door plastics. 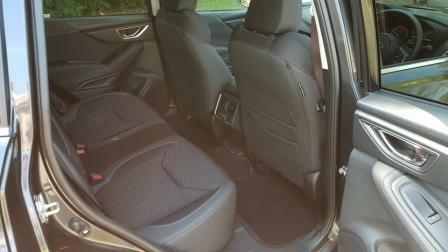 the trim in the Premium is classy, with a mix of smooth and rippled plastics, and the seats are cloth with leather bolsters. No heating or venting, though. 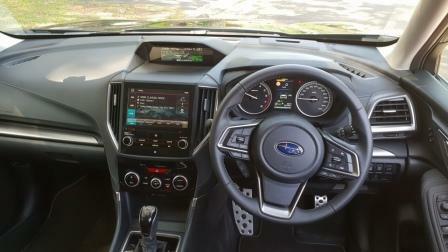 The driver has the small screen in full colour, with variable info accessed via tabs on the lower left quarter of the tiller, whilst the eight inch touchscreen features Subaru’s StarLink setup. Apps such as Apple CarPlay and Android Auto are standard as is satnav in the Premium. Above that is the smaller screen that show information such as average and on the fly fuel economy, car angle relative to the horizontal and it’s in a casing that hides a nifty little feature. It’s almost invisible but look carefully and a small red rectangle can be espied. It houses an infra-red scanner that reads the driver’s eyes, and will flash a message on the screen if the driver appears to be looking away from forward for too long. It’s an extra safety feature that is intended to monitor for fatigue or inattention, and the scanning feature works very well. It also provides an extra feature as it has a facial recognition basis, meaning that a little bit of personalisation can be added, as Subaru provides a Welcome (insert name) on the screen. There are plenty of other safety features in the Premium, such as Subaru’s much vaunted EyeSight camera setup. This provides an excellent stereoscopic forward view and goes hand in hand with the Forward Collision Warning, Adaptive Cruise Control, and the very handy Lead Vehicle Start Alert. Naturally Autonomous Emergency Braking is standard too and comes with Pedestrian Detection. 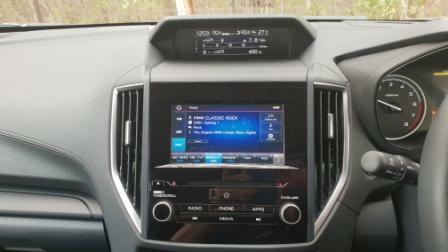 Tyre Pressure Monitoring, DAB radio, and Subaru’s X-Mode drive selector finish off the list of features. Here’s another acronym. SRH. Steering Responsive Headlights is what that one stands for and that’s self explanatory. It really isn’t until you’ve driven a car at night with this feature that you realise just how handy it is. The car itself looks similar yet different to the previous model. Along with the subtle increases in size, the nose itself is taller, bluffer, more upright. The Forester is like the Outback in one key area as well. Subaru’s design team build in a station wagon look yet it really is as big as other SUVs in its class such as Nissan’s X-Trail. This was important on the drive to Bega and back. With two in the back utilising the pair of USB ports, a few towels down for the pooch, and the cargo area reasonably full, the extra space becomes welcomed. And it’s a fair handler too on the long, sweeping, turns of the Monaro and Snowy Mountain Highways. The steering weights up progressively, with the long and gentle turns needing only miniscule corrective input. Come into the tighter, closer together, corners just west of Bega after the magnificence that is Brown Mountain, and the ratio in the steering means just a little extra work is required. It’s communicative and subtle in its method. The suspension is well balanced in how it damps down on these roads too. There are some sections where it’s like riding over a gentle swell again and again, and the Premium simply dispatches these to the boundary like Bradman did in his heyday. Drive into the turns that populate Brown Mountain, around a half hour or so west of Bega, and the Forester’s handling gets tested and found wanting for little. It’s a ten kilometre stretch of road and drops something like eight hundred metres as you drive east. The turns measured at 25 to 30 km/h simply don’t faze the the Premium; there’s a gentle dab of the brakes, a turn, a squirt of the go-pedal, and the Premium eats the road up. Subaru’s dedication to their all wheel drive platform and boxer engine make them unique in the world’s automotive family. They’re still a niche player but it’s become a bloody big niche judging by the number of Foresters seen during the review period. What really wins here is the sheer value of the Premium. Although there is a trim level above, it’s perhaps worth considering what the differences are here. The 2019 Subaru Forester Premium is an impressive car and continues to make Subaru’s once quirky niche presence bigger and bigger. Fangio. Brabham. Schumacher. Senna. Webber. Johnson. Brock. Recognise a few names? They all have one thing in common and no, it’s not the massive talent they displayed in their prime. Each and every driver had training, and lots of it. Some race drivers try and try and try and get nowhere because their talent, as good as it may be, may not be good enough. The few, the lucky few, that do, have that extra special percent that has the right door open. However, there is a new race door opening and it’s one that will still require talent. 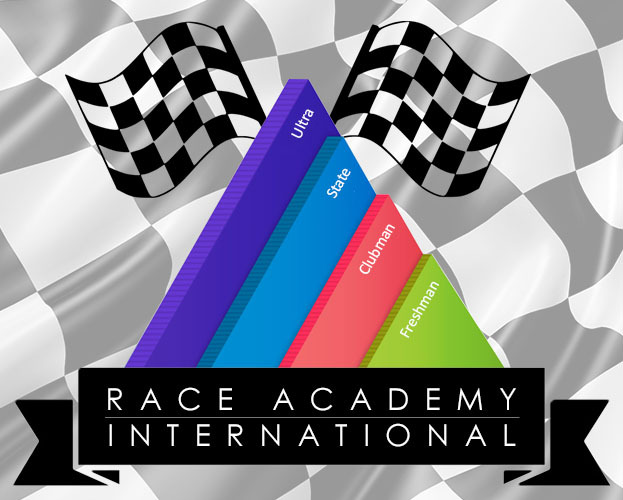 Race Academy International is a new operation and staffed by people that, collectively, have more racing experience in the blood than many of us can ever comprehend. Key to its success is the sheer spread of the instructors brought on board to help interested drivers open one of the four doors RAI has available. It’s a genuine, and real, driver’s academy, where scores are weighed up by the instructors after each applicant is put through a stringent series of tests. Door one is just $990 and the Freshman level will look at car setup, feedback to the instructors, reviewing and interpreting data, plus a full half day session at Sydney Motorsport Park which includes two 15 minute trackwork tests. Just to add extra spice, a problem solving session with an engineer during a data review will be conducted. Door 2 is the Clubman, at $1850, and looking at drivers that perhaps already have had some track time and need or want to improve upon that. There will be more intensive scoring and, in addition, a media training session and debrief interview with a motorsport journalist. Finally, any flags that a driver must need to know about on a race track will be covered in a training session. More experienced drivers can opt for door 3 or 4, with the State and Ultra sessions especially tuned for those that have that, the experience, and the mental drive to win. All sessions in each level are scored and runners up will be formally recognised and awarded. Costs here are just $2850 and $2200. Some of the people doing the training have oil and petrol running in their veins. Matt Shylan, a regular competitor at Sydney Motorsport Park, is a relative late starter, competing in motorkhanas at the age of 12. Highly respected river, team manager, and experienced in motorsport PR, Gary Mennell brings 30 years of experience to RAI. 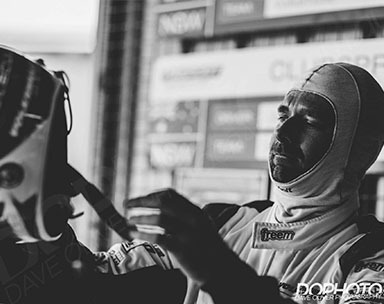 Josh Muggleton was a competitor in the Nissan GT Academy International, has raced at Bathurst, and works with the Trackschool driver training group. Linda Devlin brings an extensive CV to RAI, with endurance racing, historic racing, and numerous class racing wins. Linda started competing at just 8 years of age. Further information about this exciting initiative can be found here. BMW Reveals New Models And Updates. 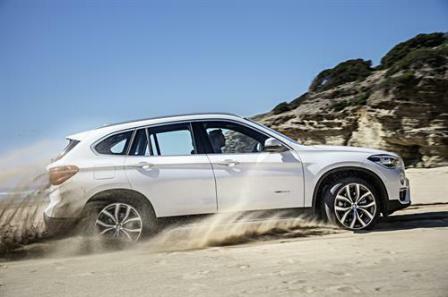 BMW’s popular X1 sports Activity Vehicle and X2 Sports Activity Coupe have received value added updates for the 2019 model year. Apple CarPlay has been added across all models in the X1 range, along with Navigation Plus and Head Up Display. An 8.8 inch touchscreen allows access to an app look interface, plus there is a voice interface called Natural Voice recognition. The X2 range also receives the Head Up Display and the Navigation System Plus. As with the X1, the X2 gets the Apple CarPlay interface as standard across all trim levels. To visually identify the entry level X2, 19 inch diameter wheels, up from 18s, are fitted. Like any company that does an update in such a broad reach, pencils have been sharpened too. The entry level BMW X1 sDrive18i is $45,900 plus on-roads (price includes GST and where applicable the LCT). The rest of the range is BMW X1 sDrive18d $49,900, BMW X1 sDrive20i $50,900, and BMW X1 xDrive25i $60,900. The X2 also gets the calculator waved over the top. 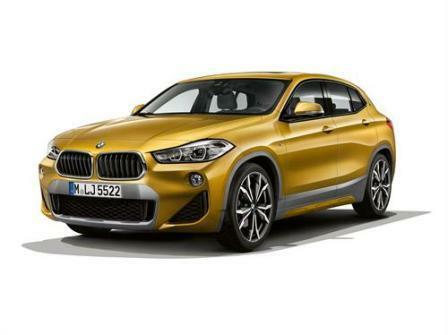 The three trim level range now looks like this: BMW X2 sDrive18i $46,900 (includes GST and LCT where applicable plus on-roads), BMW X2 sDrive20i $55,900, and BMW X2 xDrive20d $59,900. 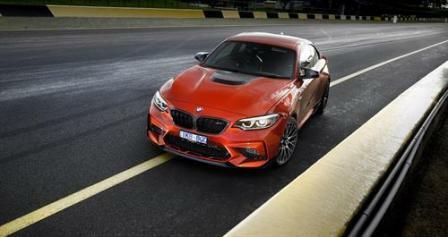 The new M2 and M5 Competition models have also been released. 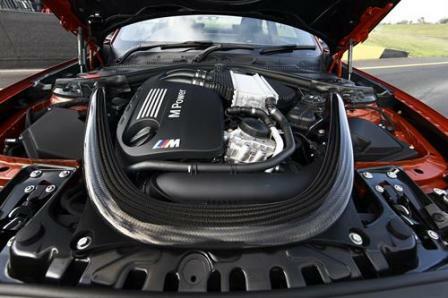 The M2 has the grunty straight six from the M3 and M4. The twin turbo powerplant develops 550Nm between 2350rpm and 5200rpm, meaning throttle response is almost instant and brings great driveability. The peak power of 305kW comes in straight after that and runs until 7000rpm. The soundtrack is backed up by a twin exhaust system and electronic flap control. The whole package sees the M2 reach highway speeds in 4.2 or 4.4 seconds, depending on the M-DCT or six speed manual transmission chosen. Top speed is controlled to 250km/h, or 280km/h if the M Driver’s package is added. The price to pay for this is reasonable, with consumption rated at around 9.0L/100km on the combined cycle. If the M-DCT is optioned in the M2, switches on the centre console provide control of drive characteristics for the engine, steering, and BMW’s Drivelogic functions. Personalisation is the key, allowing the driver to save customised settings. 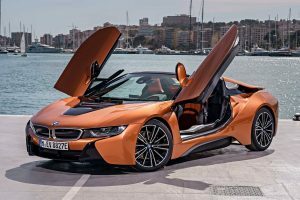 Outside there are additional body stylings to identify the M2 and M4, with an improved cooling system receiving better airflow from a bigger BMW grille and redesigned front skirt. New double armed wing mirrors are fitted and stopping power is increased with 400mm six pot, and 380mm four pot, discs, front and rear. Fettling of the suspension takes parts from the M3 and M4, with front rigidity and steering precision improved. The Dual Clutch Transmission is an option. In Drivelogic there are three drive modes: Comfort, Sport, and Sport+, with manual mode giving the driver full control over changes. In automatic mode the driver can change the gearshift timing, the intensity of the change, and even the blipping on the downshifts. 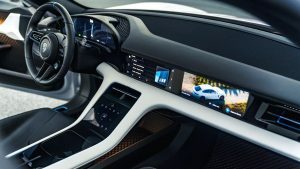 BMW also adds Connected Drive, which brings in optional driver assistance systems such as the Driver Assistant. Lane Departure Warning and Collison warning are just two of the supplementary services available. Check with BMW Australia for further details.